David Brent is the boss you never want to have in any office setting. He is arrogant, ignorant, offensive, self-centered and boisterous. Though he’s the fictional manager of the Slough branch of Werham Hogg Paper Company, many people can relate to him because every office has a David Brent to some degree. 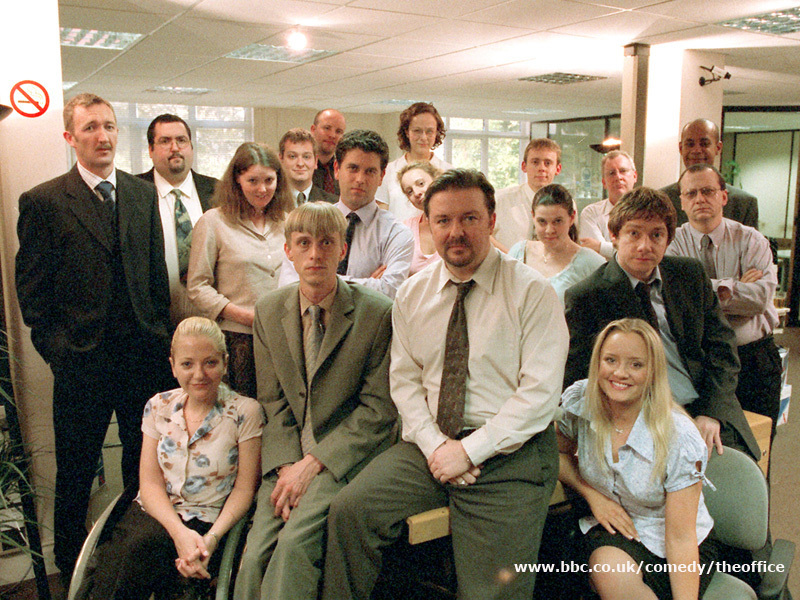 Throughout the two seasons of The Office UK David gave viewers many cringe worthy moments that were almost shocking for even those who know a “David Brent” in their real lives. It’s no secret that the branch has to downsize its employees because business is not so good in the dying economy. People are buying less paper as the world goes paperless. As a joke David thinks it would be funny to convince his secretary, Dawn, that he is firing her. He calls her into his office and tells her that she’s a good employee, but he’s caught her doing something inexcusable- she stole Post It notes. Because she stole from the supply closet, he has to fire her. She is nearly inconsolable and the joke quickly spirals out of control. David starts laughing and tells her that it’s just a joke, but she does not find it funny as she storms out of his office. David has to be the center of attention at all times. Since he is the branch manager, he feels that his employees should always listen to him in every situation and that he has the final word. When corporate sends an outside company in to educate the Slough branch on specific training material, David wants to give the presentation himself. He goes as far as taking over the entire thing, pulling out a guitar and singing songs his old band use to perform. It was embarrassing watching David make such a fool of himself, but let’s be honest- “Free Love Highway” is easily one of the highlights of the show as well! 3. The firing and hiring. While downsizing David is suppose to fire someone to help make payroll. However, when a “hot girl” needs a job, he hires her as a secretary that he doesn’t need. The worst part is not only did he hire (not fire) someone, but he hired someone with zero skills and solely based on her looks. It gets worse when he dismisses someone in the warehouse because they are a “midget.” This person is well more qualified for their job than the new hire. Everyone is on the brink of losing their jobs and naturally David Brent only has his best interest in mind. Though he wants everyone to think he is fighting for them and their jobs, he has no say whatsoever in what is happening with the company. After learning that no one’s job is safe, David agrees to take a job at corporate that not only nearly doubles his pay, but costs other employees their jobs as well. It’s the last straw for many people in the office who are tired of his selfish and vulgar behavior. The office goes out for a night of fun at a local pub for quiz night. It’s no surprise that David steals the attention and wants everyone to do what he says. He guesses an answer wrong and then demands a death round with another contestant to prove he is the trivia king. No one really cares in the end, and his pride ends up being hurt. It doesn’t affect David too much when he continues on with his selfish life the next day. It’s lucky for David Brent that the series lasted only two years. One could only imagine how much harder his life would be if the show went on past his days at the Slough branch. However, he could have been easily replaced with someone far more ignorant than he. This contributed post was written by Melissa W. , guest writer at a company specialising in serviced office rental London wide. The Most Shocking Moments of The Office UK is one of her latest articles written for DryLand London Offices.